Don Cimini, of Massachusetts-based Yankee Spirits, was named 2006 Sky Ranch MVP at an October 9 dinner in Atlantic City, New Jersey. The award was presented by the 2005 MVP winner, Steve Bellini, president of Future Brands LLC, with help from baseball great Frank Howard and Sky Ranch Foundation chairman Mike Donohoe. Cimini was honored for his support of Sky Ranch for nearly two decades, both as a leading retailer in his region and as a leader of the World Association of the Alcohol Beverage Industries, Inc. Cimini has served as national and state president of this volunteer group, the leading generator of Sky Ranch donations. The final day of the National Beer Wholesalers Association conference started bright and early with a number of educational sessions scheduled for 7 am. Some participants were a bit bleary-eyed as they made their way to the various rooms – evidently the hospitality parties the night before were a big success. The session I attended addressed the trends of United States retailers, past, present and future, conducted by Nick Lake, vice president of business development for AC Nielsen. The statistics painted a familiar picture. Our consumer-driven society expects convenience and on-demand service. Most shopping trips can be categorized in size: small trips, where purchases are $11 and under, account for 69 percent of shoppers, most looking to fill an immediate need (milk, eggs, beer); medium trips, accounting for 18 percent, for fill-in needs where consumers spend around $44; large trips, at 9 percent, the weekly grocery trips that average $100 in spending; and the extra large stock-up trips where consumers spend in excess of $125, representing four percent of excursions. So what does that mean to the beer industry? It means that the growth of convenience and dollar stores are soaring as the majority of consumers are quick-hitters. They go in, grab the goods and scurry home to consume. According to the Nielson findings, beer ranks in the top 10 of items purchased during the small, immediate-need trips. Wal-mart continues to be a mammoth in the retail world. Last year, it realized $312 billion in annual sales; and expects, over the next year, to add between 335 and 370 new stores in the U.S. Wal-mart is expanding its scope to target more affluent areas where the household incomes exceed $50,000. Other big box stores, such as Target and Costco, are on Wal-mart’s heels, but have a long way to go to catch up with the giant. As more retail outlets are added – whether convenience stores, super centers, warehouse clubs or grocery stores – the opportunity for distributors to get their product into the hands of consumers is increasing. But the message derived from all the compiled statistics is that the beer industry must keep a finger on the pulse of retailers who are constantly studying the buying habits of their consumers. In the general session, Chris Wilson, president of Wilson Research Strategies, began a rapid fire presentation filled with statistics. The clear conclusions from the exhaustive polls and research conducted by Wilson Research indicated that the general public really has no idea what a beer distributor does. Incoming NBWA chair Betty Buck charged the wholesalers to educate others regarding the important role they play in their local communities by providing jobs, supporting community events, charitable contributions and public service/educational efforts to combat drunk driving and underage drinking. Led by Benj Steinman, panelists Kim Jordan of New Belgium Brewing Company, Jack Joyce of Rogue Ales, Jim Koch of The Boston Beer Company; and Alan Newman of Magic Hat Brewing Company took the stage to discuss an area of growing interest to wholesalers: craft beer. Craft beer grew by nearly 10 percent last year. Admittedly occupying a small percent of the total beer sales, this category is gaining ground as consumers are discovering the quality of beer produced by these small brewers. There are approximately 1,400 craft brewers in the country. More distributors have been adding craft brands to their portfolio. As a result, more retailers and consumers are exposed to an ever-expanding selection. Newman said he believes there should be an exemption for small brewers to allow them to move brands between distributors, with compensation, if they feel there is a better option for them to build their business. “We brew beers that give consumers a good reason to pay more money for beer,” Koch said. Koch is cognizant of his small niche of the market dominated by brewers 100 times his size. But with that comes its own set of issues and problems, according to Koch, who approaches the industry battles from an observer’s viewpoint. “I feel like I’m a medieval peasant watching these armies marching across the landscape. I’m just hiding out in the forest still living on berries and acorns,” he quipped. The NBWA named Betty Buck, president and owner of Buck Distributing Co. Inc. in Upper Marlboro, Maryland, as its 2006-2007 Chairman of the Board. Blazing new trails and busting old stereotypes, Buck is the first female to hold the prestigious post of NBWA Chair. 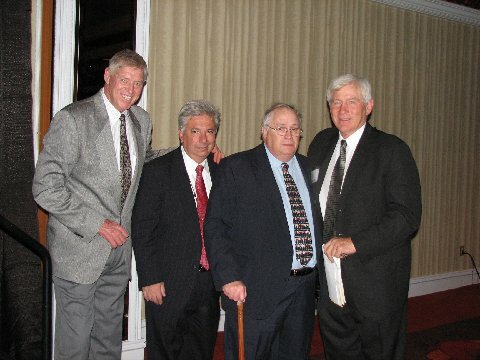 NBWA Industry Service Awards: The late Gary Nateman, former beer industry consultant; The late Mark Rodman, former counsel to NBWA; Oliver Delaney, president, Oklahoma Beverage Association; Bob Lachky, vice president, global industry development, Anheuser-Busch. NBWA Political Activism Awards: Boening Brothers Inc.; Standard Sales Company.